PTFE stands for Poly Tetra Fluoro Ethylene a polymer accidentally discovered by Mr.Plunkett at Dupont. PTFE exists in primarily in powdered form and does not melt and flow. When heated to temperatures above 350-degree Celsius PTFE changes from solid to gas phase. Because PTFE does not melt flow it is not possible to injection mould it. PTFE can however be compression moulded, ram extruded or paste extruded. PTFE Tubing is manufactured using paste extrusion. PTFE tubing manufactured using paste extrusion is flexible. It is possible to manufacture PTFE tubing with ID as small as 0.3 mm to max 100 mmand wall thickness as small as 0.1 mm to 2 mm. PTFE tubing service temperature is -60 to + 260-degree Celsius. PTFE tubing is popular as it is the most flexible in its class, because it has the best chemical resistance in commercially available polymers and because it is non-stick (in fact it is one of the most slippery substances known. Compliant with Food & Drug standards FDA. PTFE tubing sizes are denoted as IDxOD. Some standard metric sizes of PTFE tubes are 2×4, 4×6, 6×8 & 8×10 while some standard metric sizes are 1/16×1/8 , 1/8×3/16, 3/16×1/4 , 1/4×5/16, 3/8×1/2″. Small sizes of PTFE tubing are used in laboratory instruments like Chromatography, spectrometer & Titrators while larges sizes are used in sampling lines, pneumatic supply and as electrical, heat or chemical insulation. The pressure rating of PTFE tubing is dependent on the IDxOD of the tubing. PTFE tubing is fitted to equipment and machines using compression fittings such as connector and adapters.It is important that the dimension tolerance of ID & OD of the PTFE tubing be very tight so that there is no leakage at the end fitting. The fittings are manufactured in various materials like stainless steel grades SS304 or SS316 and also using PTFE material. PTFE fitting are used with PTFE tubing in applications where metal fittings are not permissible. It’s important to note that leakages are attributed to incorrect cutting of the PTFE tubing before it is inserted in the fitting. Special cutters need to be used to make a perfect straight cut. PTFE tubing is manufactured in long continuous lengths ranging from 25-250 metres or more depending on the IDxOD of the PTFE tubing. PTFE tubing can be supplied in coils or wound on plastic or wooden spools. PTFE tubing has milky opaque or milky translucent appearance and this appearance depends on the type of PTFE raw material used to manufacture it. PTFE tubing can also be manufactured in many colours like red, black, blue, green, yellow. In addition, PTFE tubing with colour stripe for identification can be manufactured. There are secondary operations that can be performed on PTFE tubing like, flaring, flanging, braiding or simply cut to length. Selecting the correct PTFE grade & brand for an application is important as every PTFE resin manufacturer designs PTFE grades with specific applications in mind. An Electrical application for example will demand that the values of the electrical properties exhibited by the PTFE tubing are on higher side of the range. PTFE tubing manufactured with dimensions according to American Wire Gauge (AWG) standards are very popular in electrical applications in industries like aerospace & automobile. PTFE tubing is flexible and can easily be bent. Care should be taken however to ensure the bend radius is not less than bend radius specified for the IDxOD of the PTFE tubing. 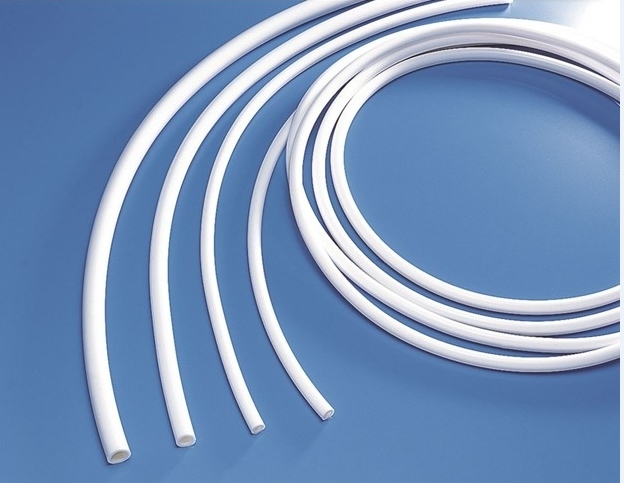 PTFE tubing is used in many industrial applications and in the last 10 years is been increasingly used in medical devices. PTFE tubing has very low coefficient of friction, which means it has extremely smooth surface. This is good news for medical device application as this means PTFE tubing has surface which will not harbour nor aid in bacterial growth. It is important to select tubing of the correct material which performs under desired conditions, is commercially viable and available. PTFE tubing fits this bill. It’s a very versatile product indeed!